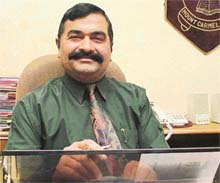 Panjab University has decided to probe the details of cases of admissions secured on the basis of “forged” documents in all undergraduate courses in affiliated colleges. At least 25 cases pertaining to different classes have been detected. The cases have been submitted to a special committee under the chairmanship of Dr Deepak Manmohan. Other committee members are Mr Rajinder Bhandari, Principal Harmit Kaur, Principal A.C. Vaid, Principal A.S. Dua and Dr Sodhi Ram, Controller of Examination. A newly married woman, Bharti (19), was found dead under mysterious circumstances, with marks of “strangulation” on her neck, in her Sector 38C residence (HNo 2446) here today. The woman is suspected to have died last night. The police came to know about the death this morning. The mystery shrouding the disappearance of a Naya Gaon based property dealer, Gopal Singh (48), was solved after his body was found floating in a canal near Ghnour village in Patiala district yesterday. Police sources said that circumstantial evidence suggested that he had committed suicide. As the date of implementation of security number plates for all vehicles — March, 2003 — approaches, local manufacturers of number plates are preparing themselves for the developing scenario. Some manufacturers have even tried to meet the challenge by manufacturing these plates as per the laid down specifications. The Chandigarh Technology Park, a prestigious project of the Chandigarh Administration being set up at Kishangarh village here, is one of the major highlights of the UT pavilion at the ongoing India International Trade Fair at New Delhi. Lack of awareness in this part of the country about the merchant navy as a career has led to a steady decline in the number of persons from Punjab-Haryana-Himachal region coming out to sea to join as officers. MEDIA managers of the Congress government headed by Capt Amarinder Singh in Punjab must be breathing easy on somehow ensuring that there was no interaction between the Press and the AICC president, Mrs Sonia Gandhi, during her visit to Chandigarh on Saturday. 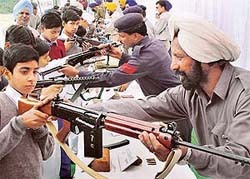 It was a day laced with hectic activity at a farm near Zirakpur, where the entire unit of J.P. Dutta’s latest film “LoC”, dawned for the shooting of some of the significant sequences in the film, that draws its base from Kargil war. In presence were stars of the order of Saif Ali Khan and Kareena Kapoor, who evaded the insisting fans on the one hand and the never-budging mediapersons on the other. Film stars Kareena Kapoor and Saif Ali Khan who are in city for the shooting of ‘LoC’. A section of members of the local Universal Cooperative House Building Society today accused officials of the Registrar of Cooperative Societies of failure to call a general body meeting of the society despite a due notice was given to the department on October 14. You look forward to weekends and dread going to the office on Mondays. You wish holidays were longer. But after you return from canoeing, or mountain climbing, the dreadful feeling of going back to the office for nine to five routine grips you again. Members of the Ilaqa Zirakpur Bachao Committee and other Resident Welfare Associations have demanded the withdrawal of notices issued by the Department of Local Government of Punjab prohibiting constructions and approval of building plans within a radius of 900m from the defence installations here. The eighth day of the ongoing Lala Lajpat Rai Martyrdom Day fortnight organised by the Servants of the People Society saw a host of activities at Lajpat Rai Bhavan, Sector 15, here today. The day which started with a serious note by a labour conference organised by the Jan Shakti, a wing of the society, included a drawing competition for children and concluded with a multilingual mushaira. 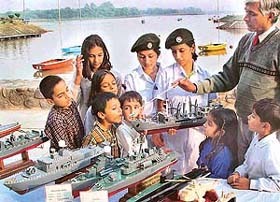 The art and science of model-making was demonstrated here today with 16 National Cadet Corps cadets exhibiting their ship and aircraft models on the occasion of the 54th NCC Day celebrations at Sukhna Lake here today. The world president of the Rotary International, Bhichai Rattakul, will pay a two-day visit to Chandigarh on December 3 and 4. WHAT strikes you about the school is an overwhelming feeling of serenity. As you approach beautifully maintained huts hidden behind a clusters of trees, amidst the courteous nods and wishes from the students hurrying towards their classes, you can not help but wondered if the 'gurukuls' of ancient India some how looked like this. The school in question is Mount Carmel convent in Sector 47. IN a world where cut throat competition, tension, stress rules the life, Mr Charles Sammuel's preaching comes as a fresh breath of energy. "Fear of God is the beginning of wisdom" he says. So this founder and principal of Mt. Carmel School, Mr Sammuel adopts a different approach altogether to prepare his students for the harsh realities of life, the maddening rat race hose bottomline is "have fear in God, impose self discipline and give your best shot in life". MY association with Mount Carmel School goes back to my post toddler stage when I had joined the school for my Pre nursery session way back in 1992. With its colourful ambience and the infrastructure could lure me to the classrooms even then. 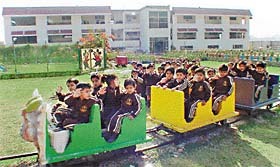 And now that the school has grown in its magnitude over the years, it has given us much more then just colourful toys. The Centre for Electronic Design and Technology of India, SAS Nagar, is all set to launch the first special effects and animation centre of North India in Chandigarh. Parents of students appearing in the State Talent Search Examination, conducted by the State Institute of Education here today, complained that in one of the centres (Government School, Sector 46), students were asked to leave the examination hall at least half an hour before the scheduled time. A two-day national seminar on “Pteridophyte — the vanishing plants” will be organised by the Department of Botany, Panjab University, tomorrow onwards, an official press note stated here today. Nearly 100 delegates from various parts of the country are likely to participate in the seminar. Sonali Mahapatra (23) has to her credit not only laurels she has won but also rich presentations she has made across the length and breadth of India for organisations as reputed as the Austrian Embassy and the Central Sangeet Natak Akademi. Kath-katha, an association of puppeteers and storytellers that operates under the aegis of the Foundation of Universal Responsibility of HH Dalai Lama, again presented the adaptation of Shakespeare’s comedy “Twelfth Night” in the medium of puppet theatre today. 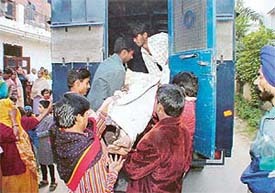 Widowed at 33, with the responsibility of a one-year-old daughter, as militants gunned down her husband, life for Swaranjeet Kaur, a school clerk in a small town in Punjab, could have been hell had it not been for the help and support of her colleagues, who instead of ostracising her for carrying the dreaded AIDS virus, brought her for treatment to PGI. The Centre has decided to set up a bone marrow transplant centre at the PGI, Chandigarh, and expand the cancer treatment facility at the All-India Institute of Medical Sciences to provide relief to the patients suffering from the dreaded disease. Rohit Bajaj and Amber, both of the Blue Bird Skating Club, Panchkula, secured the first place in boys and girls section, respectively, in the road races in the 2000 metre section of the Eightin District Panchkula Skating Championship, which came to a close this evening at Hansraj Public School skating rink, Sector 6, Panchkula. Meanwhile, a majority of the first positions were secured by the Blue Bird Skating club.